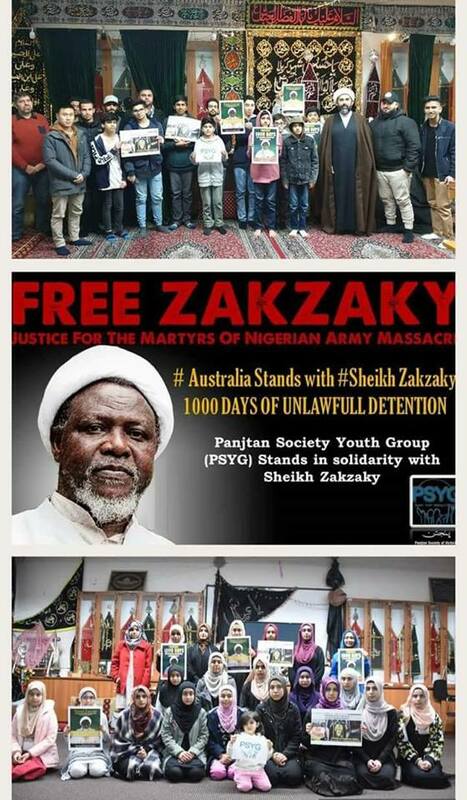 Muslim Youths in Australia stand in solidarity with Sheikh Zakzaky and his followers in a rally they held calling for the Nigerian Government to free the Sheikh from over 1000 days of illegal detention. An eminent Muslim religious scholar has been held in illegal detention since December 2015. Six of his sons were killed by the Nigerian army, while the Sheikh and his wife were shot and arrested. The Nigerian High Court has ordered the release of the Sheikh and payment of compensation to his family, but the Nigerian army and government refused to comply by the court's orders. We are protesting and demanding his immediate release.